defined on the homology of . For this is the intersection form of . For the signature of this form is the signature of . The intersection product is related to characteristic classes. These are important invariants used in the classification of manifolds. This product is well-defined because the intersection of a cycle and a boundary consists of an even number of points (by definition of a cycle and a boundary). of integer chains and . Using the notion of transversality, one can give an equivalent (and `more general') definition as follows. Take a -chain and an -chain which are transverse to each other. The signed count of the intersections between and gives the intersection number . A particular case is intersection number of immersions. Define the intersection product by . See [Kirby1989, Chapter II], [Skopenkov2005, Remark 2.3], [Skopenkov2015b, 6]. The definition of a cup product is `dual' (and so is analogous) to the above definition of the intersection product on homology, but is more abstract. However, the definition of a cup product generalizes to complexes (and so to topological manifolds). This is an advantage for mathematicians who are interested in complexes and topological manifolds (not only in PL and smooth manifolds). If , the intersection product is the intersection form denoted by . A closely related important notion is linking form. The following properties are easy to check using the simple direct definition; they also follow from simple properties of the cup product. on the free modules. This pairing is unimodular (in particular non-degenerate) by Poincaré duality. If is even the form is symmetric: . If is odd the form is skew-symmetric: . Let be a symmetric bilinear form on a free -module. Denote by ( ) the number of positive (negative) eigenvalues. Note that since is symmetric, it is diagonalisable over the real numbers, so ( ) is the dimension of a maximal subspace on which the form is positive (negative) definite. is defined to be the signature of the intersection form of . is indefinite, so the above classification theorem applies. In particular, . The claim now follows from the fact that the square of a characteristic vector is independent of the chosen characteristic vector modulo 8. Corollary 7.3. The signature of an even (definite or indefinite) form is divisible by 8. We shall show that any indefinite form permitted by the above theorem and corollary can be realised. 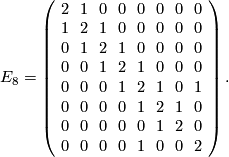 Likewise, the matrix represents a negative definite even form of rank 8.
with realise all unimodular symmetric indefinite even forms that are allowed by the above classification result. Here we use the convention that is the -fold direct sum of for positive and is the -fold direct sum of the negative definite form . [Skopenkov2005] A. Skopenkov, A classification of smooth embeddings of 4-manifolds in 7-space, Topol. Appl., 157 (2010) 2094-2110. Available at the arXiv:0512594. [Skopenkov2015b] A. Skopenkov, Algebraic Topology From Geometric Viewpoint (in Russian), MCCME, Moscow, 2015. This page was last modified on 2 April 2019, at 16:16.